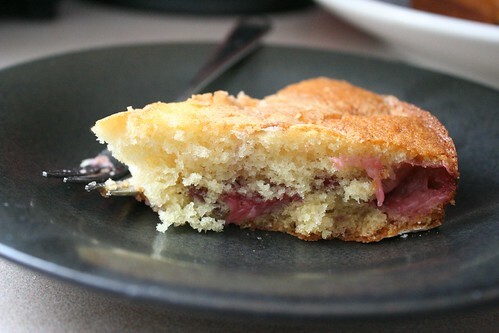 baked :: Strawberry Buttermilk Cake, originally uploaded by earthchick. 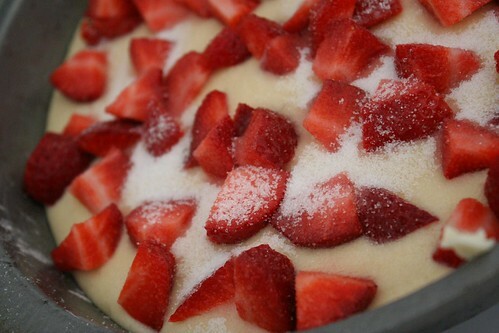 Sometimes a person just wants to bake a cake, no reason needed. Today, that person was me. That cake was this . At the end of a strange week, one that started with a flight delay, a funeral, and a sick child and ended with my husband and I both coming down with a stomach bug (with me having to drive an hour home by myself while ill), I woke up wanting to bake a cake. 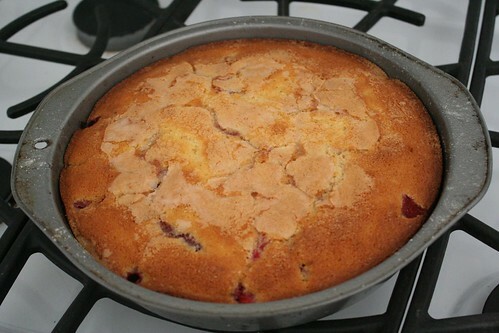 Specifically, I wanted to make a buttermilk cake. I had seen those words in an email from Zingerman’s Bakehouse and had become obsessed. 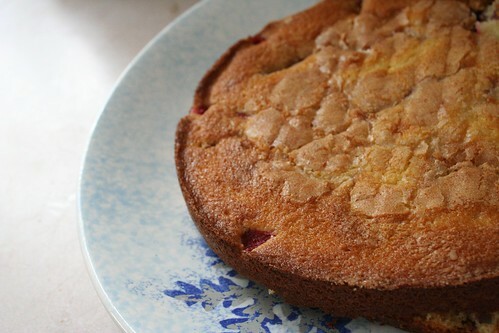 I’d never made a buttermilk cake before, but it sounded delicious! I found this recipe on epicurious and it looked perfect! I had everything! Except buttermilk and raspberries. But I did have milk, vinegar, and strawberries, so problem solved. (For the 1/2 C of buttermilk, I mixed 1/2 T vinegar with 1/2 C milk and let sit for a few minutes). The recipe couldn’t be simpler. It came together very quickly. 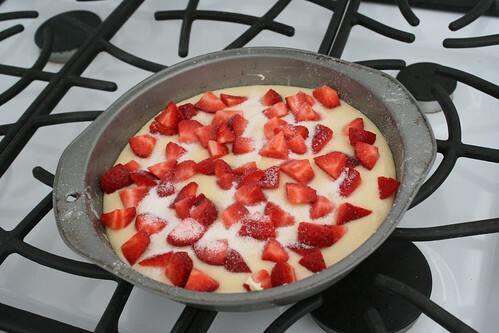 I love a one-pan cake! Per a few of the reviews, I baked at 385-degrees instead of 400. 25 minutes later, perfection. The only hard part was letting it cool. Okay, actually, the other hard part was getting it out of the pan in one piece. I knew I should’ve used parchment paper instead of just butter and flour. I didn’t take a picture of the whole cake because one edge of it crumbled. It was so delicious. A nice, light afternoon treat to go with tea. I try not to eat much sugar these days (or baked goods in general), but as far as indulgences go, it wasn’t too rich (and only 259 calories per serving – when cut into sixths). My boys loved it, too. I know I would love it more with zingy raspberries (my very favorite fruit), but it was pretty awesome with strawberries, too. I’ll be making it again, for sure! Mmmm that looks SO GOOD! I’ve done that vinegar sub before for buttermilk, so genius! 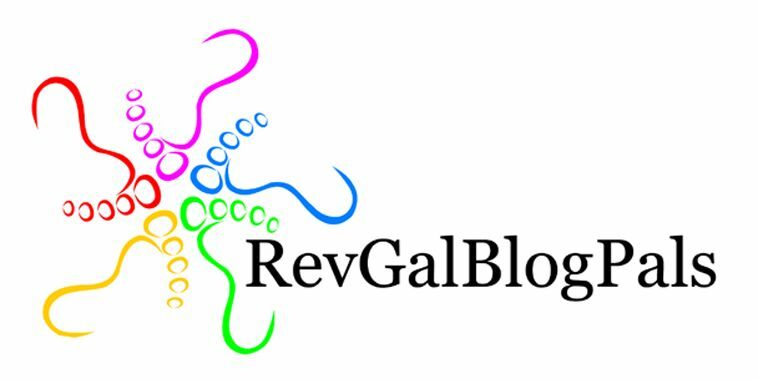 Thank you for sharing this…it looks delicious!! Like Kelly-ann, I was going to say that your strawberries look a lot better than the ones I saw in my grocery store a couple days ago. I was tempted, though. And this cake looks yummy!